ILO’s annual conference is about to begin in Geneva. 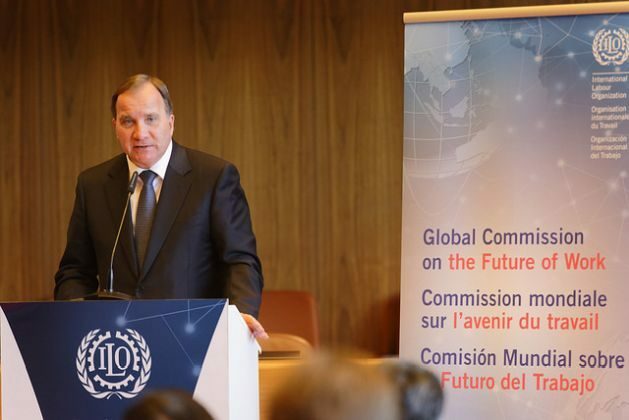 Swedish Prime Minister Stefan Löfven chairs the Global Commission on the Future of Work which seeks to bring about a UN strategy for the world’s entire labour market. He sat down for an interview with Arbetet Global. STOCKHOLM, May 22 2018 (IPS) - There’s not one answer, no single solution, Stefan Löfven replies to a question about what the most important focus for the global labour market was. – But it must work much better than what it does today. It must be more inclusive and safer. The Swedish Prime Minister adds that it is important that more women gain employment and that youth unemployment is reduced, and that the world’s nations create better systems for primary and further education. The International Labour Organization, ILO, is the UN agency for the world of work. The elementary goal of ILO is to fight poverty and promote social justice. Its role is to improve employment and workplace conditions across the world, and to protect union freedom and rights. The ILO is a conventions-based organisation with more than 180 conventions. Signatories to ILO’s conventions must report back about its work to implement the rights. The nations must allow national representatives of the employer and employee organisations the opportunity to comment on the reports. Reports for the eight basic conventions about human rights, which Sweden has ratified, must be submitted every two years. Stefan Löfven’s initiative, which seeks to ensure the benefits and profits of globalisation help more people. Employees should enjoy better conditions, businesses larger profits, and countries should see reduced social unrest. The road to get there is through a broader social dialogue – negotiations, that is. The Global Deal framework offers opportunities for partnership projects to ensure countries sign ILO conventions. 19 countries, close to 30 unions and businesses, as well as 15 or so organisations have joined Global Deal. Since August 2017, Stefan Löfven is one of the two chairpersons of ILO’s Global Commission on the Future of Work. He is tasked with designing a global strategy for developing the international labour market. Last week, he was paired with South African President Cyril Ramaphosa, who was appointed the second chairperson. The change followed a scandal, after Stefan Löfven’s previous co-chair Ameenah Gurib-Fakim, the President of Mauritius, was caught buying luxury shoes and jewels with a charity organisation’s credit card. The revelation didn’t only lead to her forced resignation as president in March, but also to her standing down from ILO’s Global Commission on the Future of Work, which was then led by the Swedish Prime Minister alone for a few months. When Stefan Löfven met his new partner, the South African President, at ILO’s Geneva headquarters this month, it was a reunion of sorts. Like Löfven, Cyril Ramaphosa has a union background and has met the former Swedish chairman of the Swedish union IF Metall several times in his previous role as leader of the South African National union of Miner Workers. Thus, it is two former union leaders that will lead work on a plan on how to shape the world’s labour market. The big question is whether the world’s employers – who often dislike regulation – will have stronger ammunition against their recommendations. Stefan Löfven dismisses such speculations. – First of all, Ramaphosa has represented both sides. He has been a union leader, but also business leader. Secondly, this is a broad commission. The commissioners have a broad range of backgrounds and employers are also represented. So, it will be the commission as a whole that will stand behind the report, Stefan Löfven tells Arbetet Global in an interview, conducted by telephone. ILO’s annual conference begins in Geneva on 28 May. There, the world’s nations, unions and employer organisations will meet to discuss labour market issues. There won’t be any global legislation, but the UN agency will develop conventions, ”lists of shame” and other soft tools to shape the labour market. One topic listed for discussion this year, is what needs to be done to reduce violence against women and men at work. An important Swedish topic is also on the agenda. One of Stefan Löfven’s largest international initiatives is his proposed ”Global Deal” to strengthen a social dialogue between nations, unions and businesses. The first ILO Conference of the year will discuss whether Global Deal will be included in an official report that would make it an UN tool. It would be a way to ensure the initiative would live on beyond the Swedish Prime Minister’s tenure. But it has been questioned. Many employers don’t want to see further regulations of a global labour market. The PM says it’s hard to predict whether Global Deal can become a UN tool. – I can’t assess the chances of that happening, but ILO is built on tripartite cooperation and it would be strange if ILO could not express that this is an important issue, he says. – This is not arm wrestling to determine a zero-sum game. It’s about creating good conditions for everyone. If employees enjoy good conditions, businesses profit from productivity gains and society benefits in turn. The entire UN – of which ILO is part – has been affected by a reduced US contribution. Everyone has had to cut costs. The question is how it will affect the design of a global labour market. – That’s really difficult to answer as I don’t know what cuts will be required by the ILO. Of course, it’s unfortunate to have to cut funding for multi-lateral agencies at a time the globalisation is accelerating. The labour movement is naturally interested in finding regulations of a global labour market. It’s also not unexpected that businesses are opposed to regulations. However, a growing question is to what extent ILO is able to affect the labour market in the face of growing nationalism. – Despite elements of nationalism, the economy works on a global level. This year’s meeting in Geneva can be considered a warm-up ahead of ILO 100-year anniversary next year, which will bring many leaders from across the world. The goal is to complete the Future Report by then, but many considerations need to be made before then. The Indian labour market, where many work in agriculture, is vastly different to the Swedish, and digitalisation also brings significant changes. – We have a final meeting in November, to discuss the final report, says Stefan Löfven. A large portion of ILO’s work is about trying to strengthen democracy and employee workplace rights. At the same time, the trend today is the reverse. In 70 countries, democracy deteriorated last year, according to a report by think tank Freedom House. The freedom of the press is also under threat in several countries, and dictatorships use terminology such as “fake news” to defend themselves against audits. – There is always an element of that. There’s always those going in a different direction, but it’s our responsibility to work for democracy.